The kettlebell press is your basic upper-body kettlebell exercise. Learn how to make your shoulders and arms strong, and not get yourself hurt. First off, you will start the press from the middle position of the kettlebell clean. 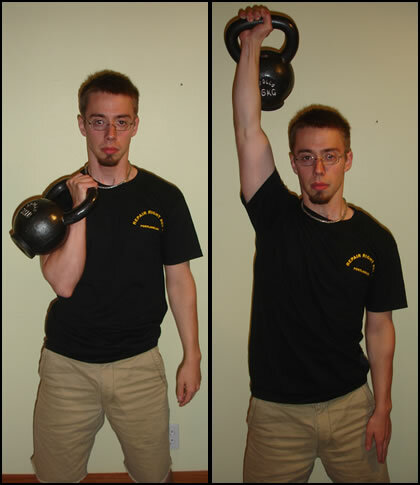 Your forearm and the kettlebell are in contact with the trunk of your torso. your shoulder must be firmly seated in its socket. With these technical issues attended to you can focus on what you need to, namely, lifting that heavy hunk of iron. Keeping the body tight (glutes, abs, lats, upper torso, etc.) will keep you from losing your balance, leaning back, or doing anything else that would hurt you. Likewise, keeping your shoulder firmly down & nested in its socket will keep your shoulder safe from injury. Your whole body should feel compressed, tense, and strong. From the top position of the clean, rotate your forearm while keeping it vertical and press the kettlebell overhead. Stretching and locking your arm out fully, pause at the top for a second and then lower it. While lowering the weight pull your forearm, from elbow to fist, back in towards your body. This will keep your shoulder seated in its socket and away from injury. I tried to look serious in these photos too, and I still look angry. Just concentrate on the form outlined in them and not on my dry facial expression. Happy facial expressions should happen after something as exhausting as the press, not during it. Do the lift like I'm doing it in the photo. Slow it down, so that it takes almost 2 minutes to perform 1 repetition. Stop at sticking points, the weak points where the lift is difficult. This will build more strength there. Lift 2 kettlebells at once, one in each hand. If you're crazy intense, stand on one foot while doing the kettlebell press. Do this only if you have really good balance to start with. Spread your fingers and hold the kettlebell by supporting it under its circular body. This will build you great hand and finger strength. Include the kettlebell press in a full kettlebell routine; that's where it will do the most good. Integrated it with some lower body exercises (my favorite being the kettlebell swing) and darn, it's gonna be awesome! It's a simple exercise, but a good one. Get more endurance, get stronger, and start lifting and pressing your own chunks of metal. • Click here to get more info about kettlebell workouts & exercises! • Click here to leave 'Learn the Kettlebell Press!' & go back to the Complete Strength Training Home-page!